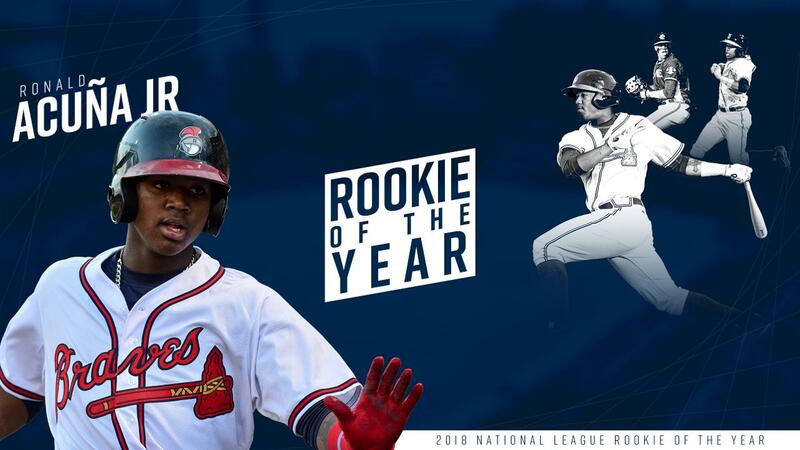 The Rome Braves and Atlanta Braves congratulate OF Ronald Acuña Jr. on winning the 2018 National League Jackie Robinson Rookie of the Year award. Acuña Jr. captured 27 of 30 first-place votes from the Baseball Writers' Association of America (BBWAA), which has given the award nationally since 1947. Acuña Jr., 20, finished his first major league season hitting .293 (127-for-433) with a team-high 26 home runs, a .917 OPS and 16 steals in 111 games. He became one of five players in baseball history to reach 26 home runs in a season prior to his 21st birthday and is the 10th player in history to have 25 home runs and 15 steals in his rookie season and the first since Mike Trout in 2012. He becomes the eighth Braves player to win the Rookie of the Year award and the first since former Rome Brave Craig Kimbrel did it in 2011. The last Braves position player to be named Rookie of the Year was SS Rafael Furcal in 2000. "First of all I would like to give thanks to God, my family, my parents and to all my teammates who've always supported me from the first day that I got the call to the big leagues," Acuña Jr. said. "This award represents all our hard work as a team this season." The 6-foot-0, 205-pound native of La Guaira, Venezuela, who is currently playing with the MLB team that is competing in the Japan All-Star Series, appeared in all 68 games for the Braves after the All-Star break, and hit .322 (85-for-264) with 19 home runs, 54 runs scored, a .403 on-base percentage and a .625 slugging percentage. His 85 hits were the second most among all players in the majors post-break, while his 54 runs tied for the second most and his 19 home runs were tied for fourth most. His 1.028 OPS was the fifth highest. Acuña Jr. entered 2018 as the No. 2 overall prospect according to MLBPipeline.com and began the season with Triple-A Gwinnett. The club selected his contract from the Stripers on April 25 and he made his MLB debut that night at Cincinnati at the age of 20 years, 128 days. He became the youngest player to debut for the Braves since Julio Teheran debuted at the age of 20 years, 100 days on May 7, 2011 and the youngest position player since Wilson Betemit (19 years, 320 days) in 2001. As a member of the Rome Braves in 2016, Acuña Jr. hit .311 with four home runs and 18 RBI helping Rome win its second South Atlantic League Championship. In 2018 he singled in his debut against Kevin Shackelford for his first career hit, before hitting his first homer the next day off Homer Bailey in his first plate appearance. Acuña Jr., at 20 years, 129 days, became the youngest player to homer for the Braves since Andruw Jones hit a solo shot on August 23, 1997 vs. Cincinnati at age of 20 years, 122 days. Acuña Jr. hit eight leadoff home runs this season to set the franchise single-season record and pass the previous mark of seven, set by Marquis Grissom in 1996. He also homered in five straight games, August 11-August 14, to tie the franchise modern-era record for most consecutive games with a homer. Prior to Acuña Jr., who hit six total homers during his run, the last Braves player to go deep in five straight was Brian McCann in 2006. Acuña Jr. also became the youngest player in baseball history to homer in even four straight games. Acuña Jr. also became the youngest player in baseball history to hit a grand slam in a postseason game when he did so in the second inning of Game 3 of the NLDS vs. Los Angeles. Prior to this season, New York's Mickey Mantle was the youngest to hit a grand slam in the playoffs, doing so at the age of 21 in Game 5 of the 1953 World Series against Brooklyn. Acuña Jr.'s slam, which came on a 3-1, second-inning pitch from Walker Buehler, was the seventh in Braves postseason history and the first of Acuña Jr.'s career. Along with Kimbrel and Furcal, the other five Braves to win the Rookie of the Year award are OF David Justice (1990), 3B Bob Horner (1978), C Earl Williams (1971), OF Sam Jethroe (1950) and SS Alvin Dark (1948).